It's time again to reveal our picks for the Secret Recipe Club. The Secret Recipe Club is a group of food bloggers who secretly make one of someone else's dishes and post them all on the same day at the same time. It's really fun, choosing a recipe to make, making the recipe, then reading about everyone else's recipes. It's a great way to "meet" other bloggers and check out some great blogs that you never knew about before. This month I was assigned the blog Katherine Martinelli. Katherine is not only a food blogger, but she is also a published food writer, travel writer and a professional photographer. She is a native New Yorker who is currently living in Israel, so the food portion of her blog showcases a wide variety of cuisines. This made it quite difficult to narrow my choice down to one recipe. I found so many amazing recipes that I wanted to try. I have recently discovered that I love making meatballs and am always on the lookout for new and different recipes, so her Turkey Meatballs with Dates, Lentils, and Yogurt Sauce definitely caught my attention. I am also still in soup mode, so I was also intrigued by her Kitchen Sink Lentil Soup. Ultimately, I was not able to narrow it down to one recipe. I made two of hers this month. First I made her Curried Cauliflower Soup. It's made with roasted cauliflower = so good. Of course, mine didn't turn out as pretty as hers, (I need a new immersion blender badly. Mine is really old and the blades are duller than butter knives! ), but it was absolutely delicious nonetheless. Then I made her Rigatoni with Wine-Braised Chicken and Saffron Cream. I had a jar of saffron in my cabinet that I had been anxious to use ever since I scored it for free (this was quite a score as saffron is the most expensive spice in the world and this little jar, which contained 1 tsp, cost $16). And strangely enough, I had never cooked with rigatoni before either. So this recipe was perfect. Sprinkle chicken with salt. Heat oil in heavy large skillet over medium-high heat. Add chicken and cook until golden, about 7 minutes per side. Transfer chicken to plate. Add onions and garlic to drippings in skillet; sauté until onions are slightly softened, 7 to 8 minutes. Add wine and saffron to skillet; bring to boil. Continue to boil until liquid is thickened and reduced by half, about 8 minutes. Add chicken broth to skillet. Return chicken to skillet; bring to boil. Reduce heat to low. Cover; simmer gently until chicken is very tender (adjust heat to prevent boiling and turn chicken over after 20 minutes), 30 to 45 minutes total. Transfer chicken to plate and cool. Shred chicken meat; transfer to a medium bowl and reserve. Cook pasta in pot of boiling salted water until just tender but still firm to bite, stirring occasionally. Drain; return to pot. Meanwhile, add cream to skillet and boil until sauce is reduced to 2½ cups and is thick enough to coat spoon, about 10 minutes. Stir in chicken pieces. Stir over medium heat until heated through, adding more broth to thin sauce as needed, about 5 minutes. Season with salt and pepper. To serve, place rigatoni in shallow bowls and top with chicken mixture. Garnish with chiffonade of basil. I didn't change very much about Katherine's recipe. I cut back on the wine a bit because I don't like too much wine flavor in the finished dish. I also used less garlic and I left out the lemon juice that she used. The only other thing I did differently was that I served the chicken on top of the rigatoni while she mixed hers together. This dish was a big hit with my family. My husband liked it a lot more than I thought he would. It's too bad I used up my entire jar of saffron because I would love to make it again soon! Please check out Katherine's amazing site if you haven't already. Thanks for the recipe, Katherine! wow! saffron cream sauce... incredible! You're like me, I can never narrow it down to just one recipe! I usually end up making multiple ones too but it takes me a while. 2 great choices here! Wow! This recipe has perfect timing. I've been wanting to braise something and use my saffron! You've picked two of my favorite recipes!! Yours came out absolutely gorgeous and I am beyond thrilled that you liked them :-) So glad you had me this month! This looks AMAZING! Great SRC pick. Imagine being paid to cook?!? How awesome would that be? You got a wonderful meal out of this. Looks delicious. look how cute your blog is! 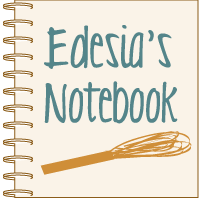 i adore that it's called Edesias "notebook" and it's written on a notebook! haha. seems obvious, but it isn't. also: love pasta. good choice. happy src day. Looks like one amazing dinner. Wow, look at the color! It looks so decadent and sophisticated. What a wonderful pick. The saffron cream sauce sounds just amazing. Wow ... both of these recipes sound amazing! And I love the roasted cauliflower garnish on the soup! I will be giving both of these recipes a try! These both look great--I love Katherine's site. My 5 Year Blogiversary and a Giveaway!